What does it mean to be a refugee? Is it really possible for us, living in a world not ravished by a war, a dictatorship or any other hardship that jeopardizes our lives, to really understand the plight and turmoil a refugee is faced with? I think that literature can be as powerful as a documentary, as a film, as a direct account published in a magazine, can make us enter a world unknown to us to the point that we become the hero/heroine of the story and we experience his/her reality so profoundly that a door to the understanding of a new reality is sprung open before our eyes. 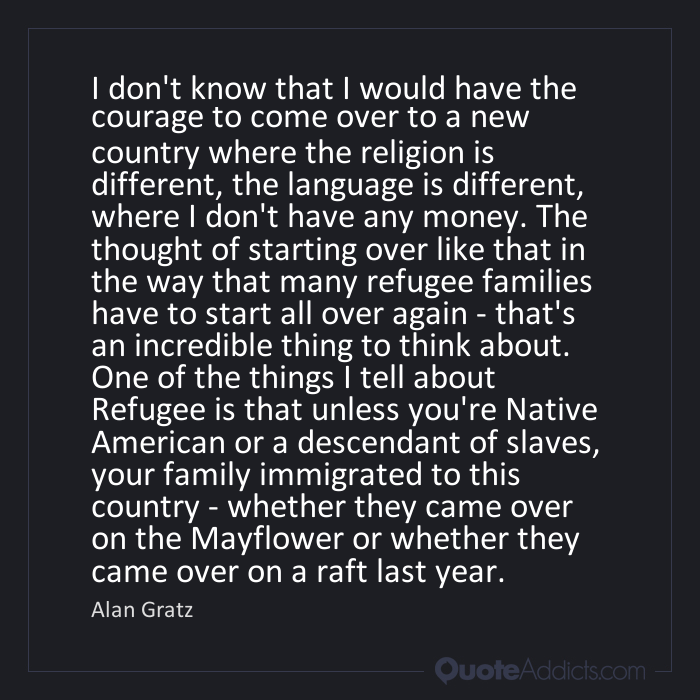 This is what, to me, the novel Refugee by Alan Gratz https://www.alangratz.com/does: it revolves around three main characters from three different eras to investigate the theme of being a refugee over time and space. This book is fiction, but the author shares how he took from real people and real facts to create this very realistic and poignant story that follows three young children: Josef in 1930’s Germany, Isabel in 1994’s Cuba, and Mahmoud in 2015’s Syria. As a teacher I feel the urge of dealing with topics that create a bridge between an investigation of ourselves as human beings and the current affairs/events that involve us all. I long to find a link between literature and the great lessons it can teach us, between the aberrations of our specie and the great humanity we are capable of, between the horrible dark events we read in history books and the witnesses of great deeds carried out by normal people, just like me and you. 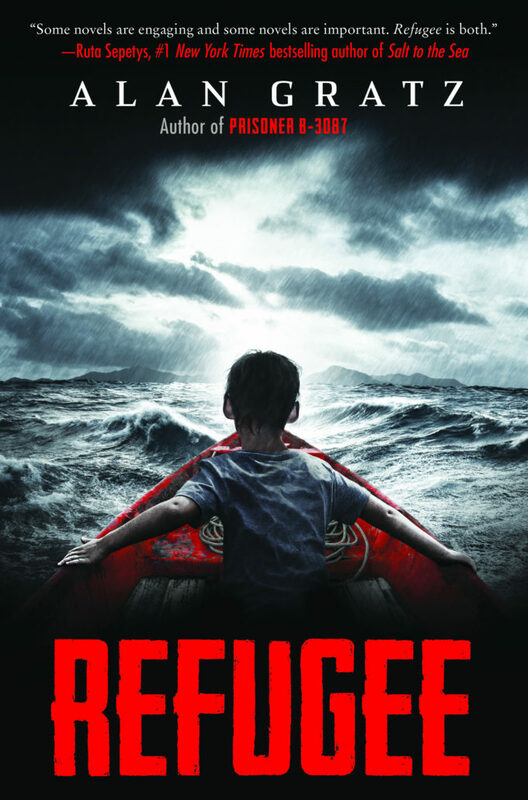 Literature empowers us in our sould and our minds, literature can investigate historical facts with accuracy, as we can see in the young adult novel Refugee. It is a novel meant for you, because you are the ones who can make a difference by questioning your present by understanding our past. As a teacher I can promote and foster this awareness so that you become a citizen of the world. Syria is always on the news, but how much do you really know about the fighting there? Do you know how many people are refugees of that country, and what they go through to get to a safer place? Filmmaker Lior Sperandeo captures the raw emotion of life as a refugee in a short film for National Geographic. Watch it and find some links with the booktrailer. All three kids go on harrowing journeys in search of refuge. All will face unimaginable dangers — from drownings to bombings to betrayals. But there is always the hope of tomorrow. And although Josef, Isabel, and Mahmoud are separated by continents and decades, their stories will tie together in the end. Refugees have been around for years. They are fleeing war-torn countries and dictators that do not have the best interests of their people at heart. These are young men and women, not even in their teens, who have to face cruelty, death, and violence all the time. Even when they leave their home country, this does not stop. All three characters in this book face loss. Not all of the people with them survive to find freedom. Their journey is not easy, but it’s very much a reality for refugees in the past and today. This book brings all these stories full circle, connecting the past refugees to the present, and it’s done in such a phenomenal way. This is an important book because it teaches young readers how people become refugees and what those individuals suffer. The Syrian conflict has torn the country apart, leaving thousands dead and driving millions to flee their homes. Many seek refuge in neighbouring countries but others pay traffickers to take them to Europe – risking death, capture and deportation. Try Syrian Escape Route. This SmartBoard activity was published by BBC. It allows you to make choices. —- What route should you take? How do you spend your money? What items do you take? —- The site also includes real stories of survivors. What would you take with you if you were forced to flee your country? Explain why you chose the object and what it means to you. These objects were carried by migrants who survived the perilous journey from Syria. A Syrian refugee tells how he nearly drowned in a lorry of melted chocolate as he tried to enter the UK. There are many other stories of refugees you can listen to or read about. I do not know whether it is right or wrong to interview children and ask them questions about their experience as refugees. I do not know whether making them tell us their plight is morally plausible or reprehensible. I just know that after reading stories about refugee children and after watching some interviews I felt the urge to know more and investigate to give these children a voice and to give them some kind of dignity. It is just by knowing and by sharing our knowledge that we can make a difference. This is the reason why I decided to write this post and I asked you to read the novel. UNHCR Special Envoy Angelina Jolie visited Lebanon’s Bekaa Valley, to meet 11 year old Hala and her five siblings who arrived as orphans from Syria’s war. How can you give a voice to one of these children? Now that you have read the novel, watch the reviews and see whether they are satisfactory to you. If you were the reviewer of the novel, what aspects would you emphasise? Strengths? Weaknesses? Why would you recommend it? What short passages would you read out to persuade the potential reader? 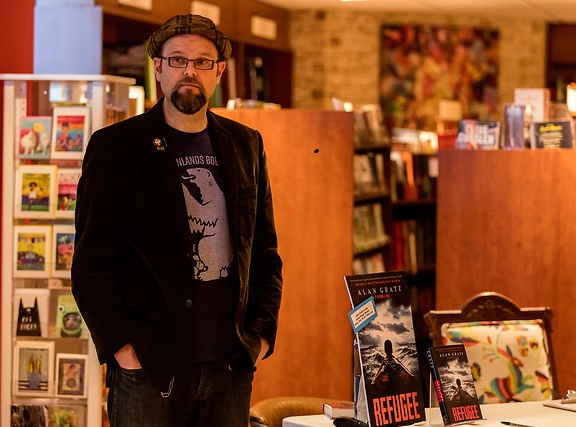 If you could ask Alan Gratz some questions about the novel in general, what would they be? If reading helps us widen our horizons and open new doors to the undestanding of the world and ourselves, writing in general and writing poetry in particular empowers us. A pen can be a fierce and powerful way to fight back and protest against what we deem as unfair, outrageous and utterly unacceptable. Spoken poetry is a way to speak out and speak up, it is a way to raise your voice in ever involving ways. Listen to this spoken word artist. Does in inspire you in any way? If you were asked to write a poem for Syrian kids, what would it read like? The following film is based on a rhythmic poem entitled ‘What They Took With Them’ by Jenifer Toksvig. Jenifer was inspired by stories and first-hand testimonies from refugees forced to flee their homes and items they took with them. The rhythm and words of the poem echo the frenzy and chaos and terror of suddenly being forced to leave your home, grabbing what little you can carry with you, and fleeing for safety. If war and violence tore apart your country and you were forced to suddenly run for your life, what would you bring with you? American photographer Brian Sokol, working with UNHCR staff around the world, has posed this question to hundreds of people who have experienced this terror first-hand. The resulting photo project, “The Most Important Thing,” provides surprising and thoughtful answers to this question. Now it is your turn: you can use any of the creative tasks suggested in this post (book trailer, video interview, podcast, newspaper article, photo project, spoken word poetry, poetry film, interview with the writer, etc.) to devise your own way to raise people’s awareness as to the plight of refugees.